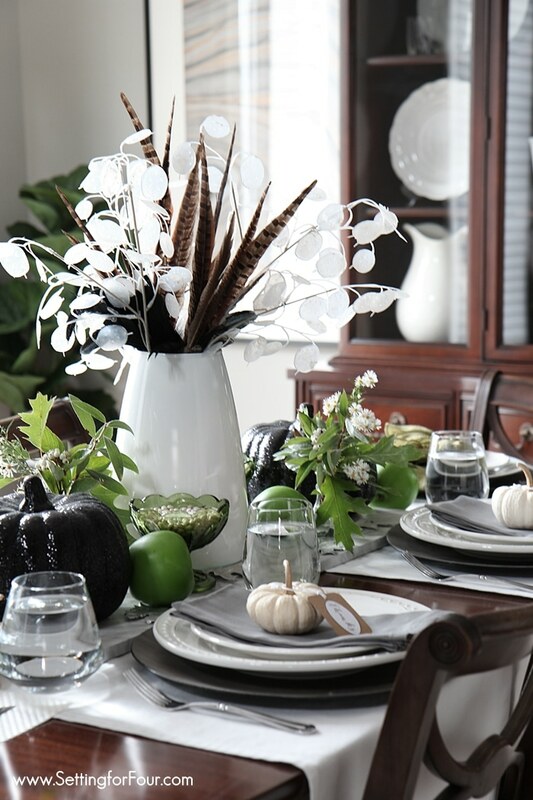 Take a nature walk outside and gather some wildflowers, branches and leaves for an easy fall tablescape! These fall wildflower tabletop decorating ideas will give your basic white dishes a show stopping look for Autumn. 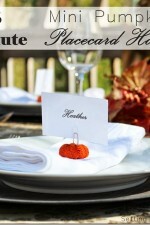 Adding these charming pumpkin place cards to each place setting also adds festive fall style to your table. See how you can create this look! Let’s take a nature walk outside! 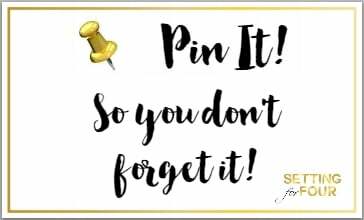 It can be along a country road, an outdoor trail or a park! Let’s collect some branches, leaves and wildflowers and create a fall wildflower tablescape filled with the simple beauty of nature! Today’s natural tablescape is inspired by all the treasures you can find outdoors on a beautiful fall day. I love fall walks in the brisk air and the smell of fallen leaves – do you? 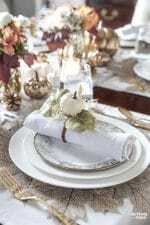 And isn’t it fun to set a table with a beautiful presentation to make our autumn and Thanksgiving meals extra special? 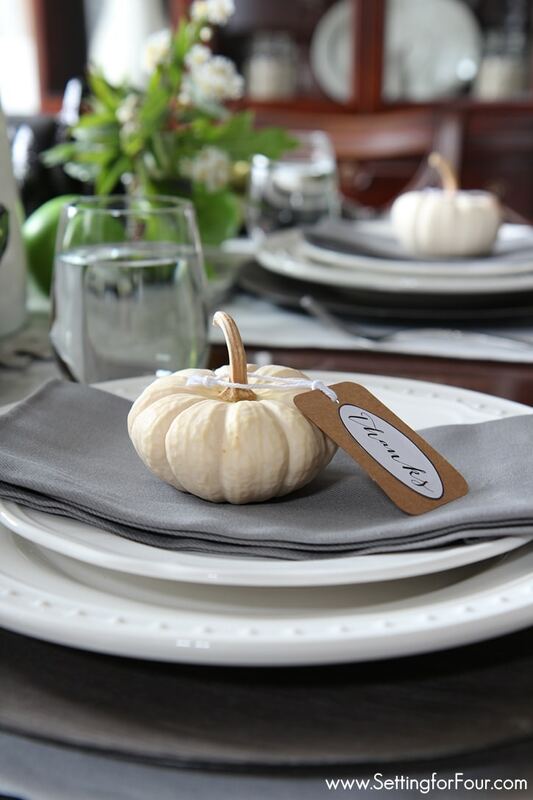 This post has been updated with new information and shares decorating tips on how to turn simple white dishes into a Fall fabulous tablescape. 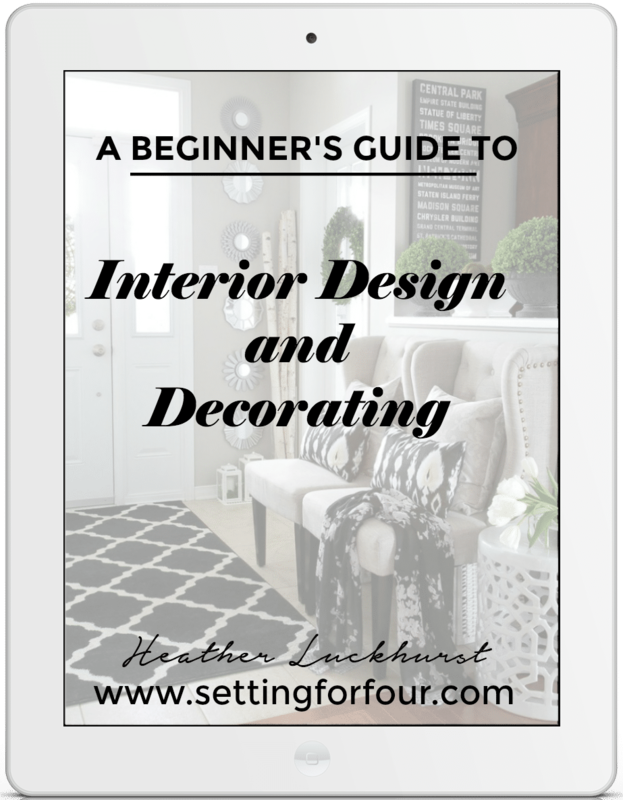 Add your own style and decorating twists to my table setting ideas to personalize your dining area for your home! 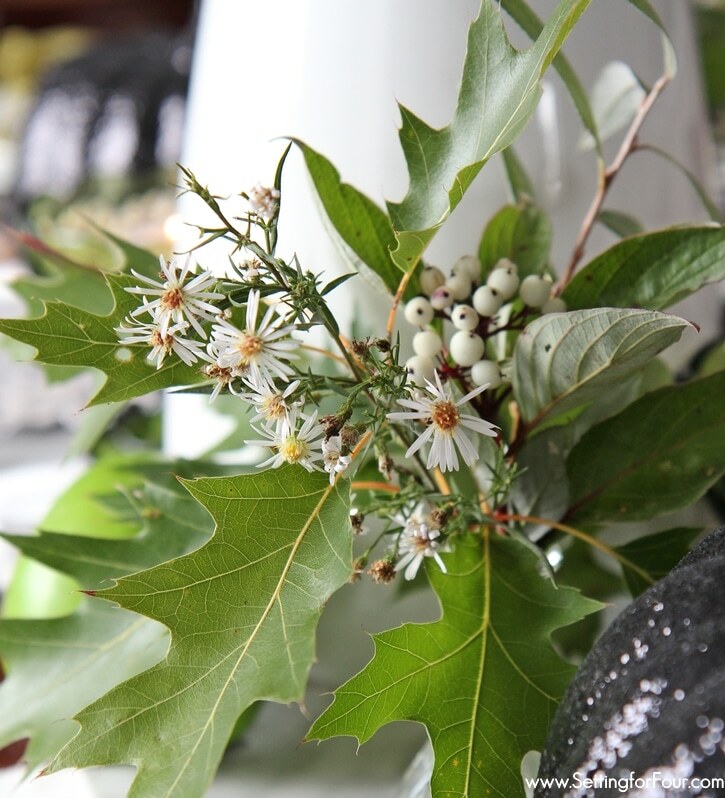 I love to combine natural elements like oak leaves, snips of berry branches and fall wildflowers with vintage ironstone, glossy white ceramic, vintage green glass and grey linen. It’s all about the contrast of simple rustic accents and luxe shine! I went for a walk the other day and gathered these gorgeous oak leaves, white berry stems and wild aster wildflowers…..so pretty! 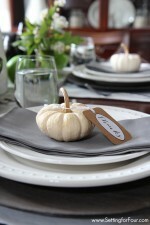 I placed a mini white baby boo pumpkin tied with this pretty fall tag to each table setting for a festive harvest look. Get your FREE ‘Thankful’ tags here. Layer white dishes with white table runners for a simple white on white look. Your dishes don’t have to match! I used two different patterns for this look. I love mixing my napkins too. 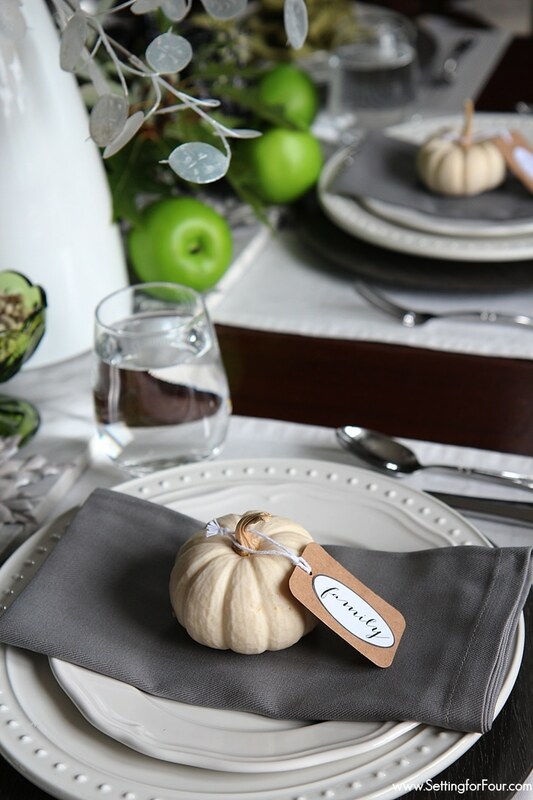 I usually use one color on the table ends that pick up a color in the tablescape (here I used green napkins to pick up the green in the leaves and apples) and a neutral color (like these gray napkins) on the side table settings. These vintage green glass dessert cups are a thrift store find from years ago….I added dried white navy beans (another fall harvest touch) and a votive to each….love the shimmery candlelight! 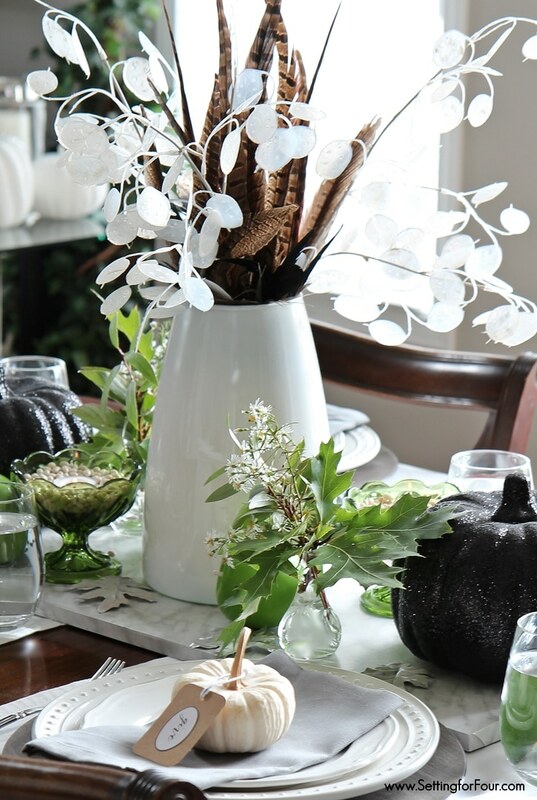 I hope you enjoyed my Fall Wildflower Tabletop Decorating Ideas! 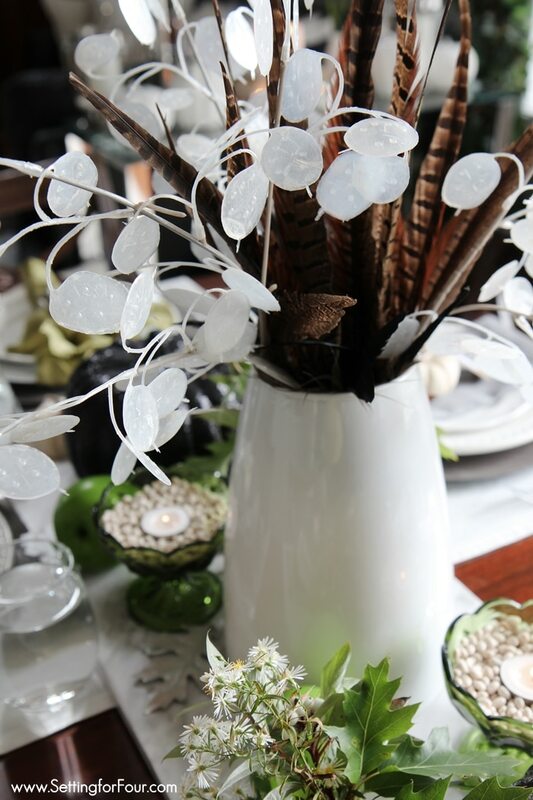 You can make this tablescape as simple or ornate as you like! Table Decor Sources: Click on each image to see more about each item! Great post! I love the vase painted with the oil based paint too! 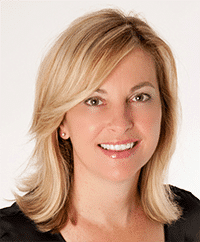 Thank you Starr – glad you like my post! 🙂 Have a great day! Simply, yet very elegant. I love it, thanks! This setting is so amazing Heather! I love the combination of elements that you’ve used, so unique! Thank you Janelle!! 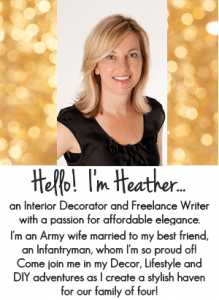 I have a tablescape post coming up next week too – so stay tuned for that! 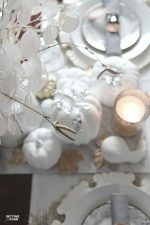 I have new white dishes and have been having trouble working them into a Fall table setting. You have inspired me! Love the look. It looks very fresh and modern to me. Great take on the holiday table. I have some vintage glass as well. I will be using the white navy beans and tea candle idea with them. Thank you! 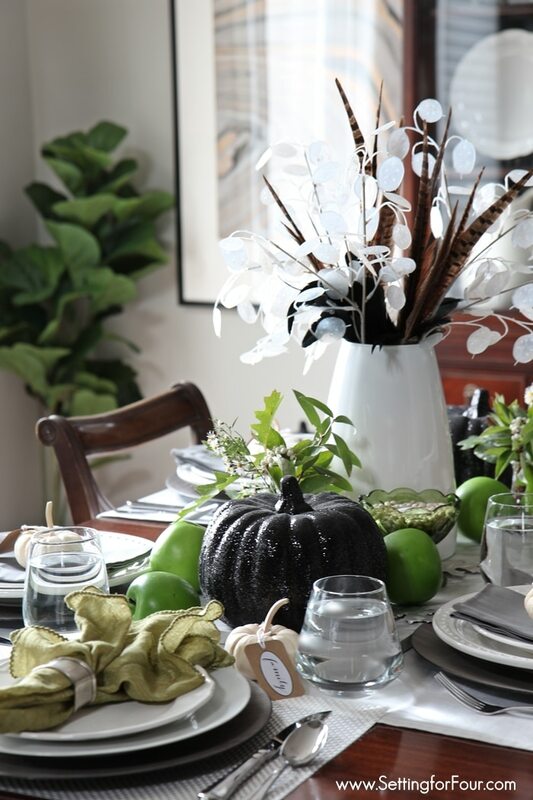 I love all the natural elements and of course those darling white pumpkins! You have great taste! your table decor looks stunning!!! The simplicity of this table makes a very inviting and relaxing setting. Thanks so much for your lovely compliments Sandra – have a great day! I’ve been wanting some pheasant feathers to use in my Fall decorating and never thought to check Amazon; thanks!